One of the most exciting recent technological advances with regards to new mobile smart phones has been the ability to download applications, or 'apps', providing various information or activities for users to enjoy. 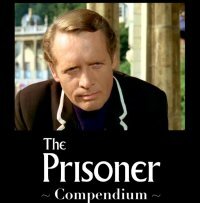 The Unmutual Website was therefore fascinated to receive a communication this week regarding what is believed to be the first ever "Prisoner App", produced by Prism Apps and entitled "The Prisoner Compendium", available for the iPhone and iPad. The compendium is a collection of quizzes, information, locations, and guides related to the series and is available from app stores and itunes at a cost of $1.99. Click HERE to visit the itunes store. Prism have been very kind and donated no less than THREE free download codes of the app to The Unmutual Website. To be in with a chance of winning (entries close 18/6/12), simply send an email to TUW and answer the following question; "In "Arrival" what does the operator reply to Number Six's line; "haven't got a number"? 3 randomly drawn correct entries will win the prizes. UPDATE: Winners: EP (Berks), SL (Manchester), DJ (Canada). Answer: "No number, no call!" With thanks to Eliot of Prism Apps for the news and giveaways.